An Iditarod musher was ‘starting to freeze.’ Another helped him instead of finishing the race. Iditarod mushers Jim Lanier and Scott Janssen both dropped out of the race Friday after they asked for emergency help on the trail and were picked up by snowmachine. Around 7 a.m. Friday, the Iditarod Trail Committee was alerted that Lanier and Janssen had requested emergency assistance due to "weather conditions" between the White Mountain (mile 921) and Safety (mile 976) checkpoints, in a place known as "the Blowhole" — an area notorious for hard winds, Iditarod race marshal Mark Nordman said in a written statement. "A search and rescue team was immediately notified and then a plan was put in place to safely extract both dog teams and both mushers," Nordman said. Janssen had come across Lanier on the trail. Lanier's team was stuck, and Lanier was "starting to freeze," according to a post from Scott Janssen's Facebook page, The Mushin' Mortician, on Friday afternoon. Lanier had 13 dogs and Janssen had 11 when they left the previous checkpoint in White Mountain. Race officials said that Janssen first used a satellite phone to call a family member, who then alerted Iditarod officials. Soon after, Janssen pushed the SOS button on his Spot tracker. 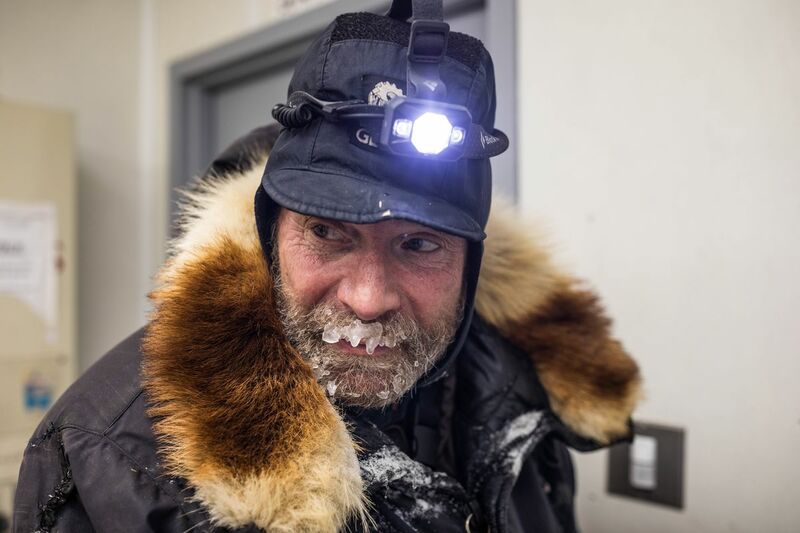 "(Janssen) stayed with his friend until they were rescued and he chose to accompany his friend to Nome to make sure he was safe, but that meant scratching from the race. His team is loaded in a trailer on the way here," the Facebook post said. The two men were taken to the Safety checkpoint via snowmachine. They officially scratched at 11:30 a.m.
"Lanier scratched out of concern for his race team and personal health reasons," the Iditarod statement said. "Janssen scratched out of concern for Lanier's safety." The mushers were then picked up by helicopter and taken to Nome, race officials said. Both men were in Nome on Friday, "with their loved ones and also in good health," the statement said. 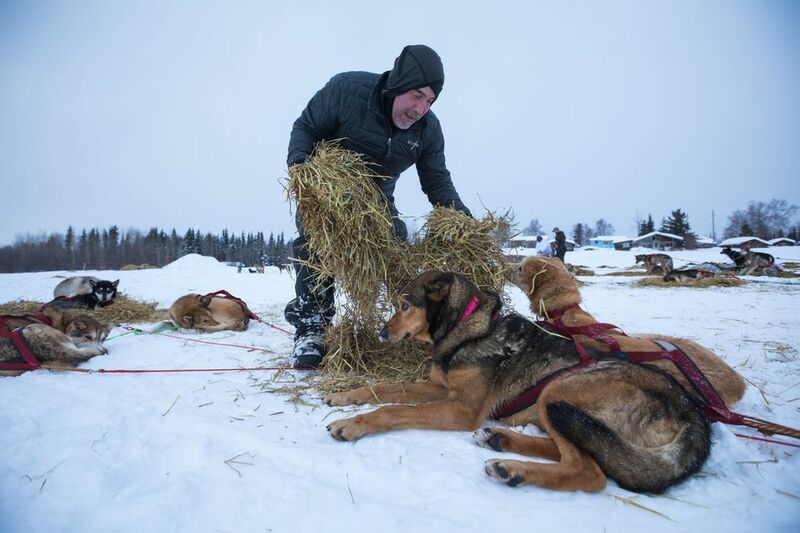 Their dog teams were mushed to Nome, race officials said. Lanier is a 77-year-old Chugiak musher who has run 20 Iditarod races since 1979. He has scratched three times prior to this year. His highest placement was in 2004, when he came in 18th. This is Janssen's seventh Iditarod. He has scratched four times in the past. Lanier's wife, Anna Bondarenko, wrote on Facebook on Friday morning that the situation was "very serious." Lanier left White Mountain feeling sick, she wrote. "If you know (Lanier), you know he is tough and does not complain about anything. If he says he needs help it means he is really in deep trouble. Scott Jansen (sic) is with him and he made a call. Search and rescue is on their way from Nome," Bondarenko wrote Friday morning. A few hours later, Bondarenko posted an update, saying the two men were safe. Neither man requested additional medical support in Nome, race officials said.